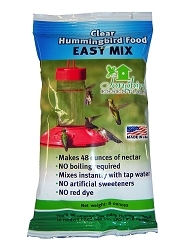 A revolutionary way to feed more hummingbirds! 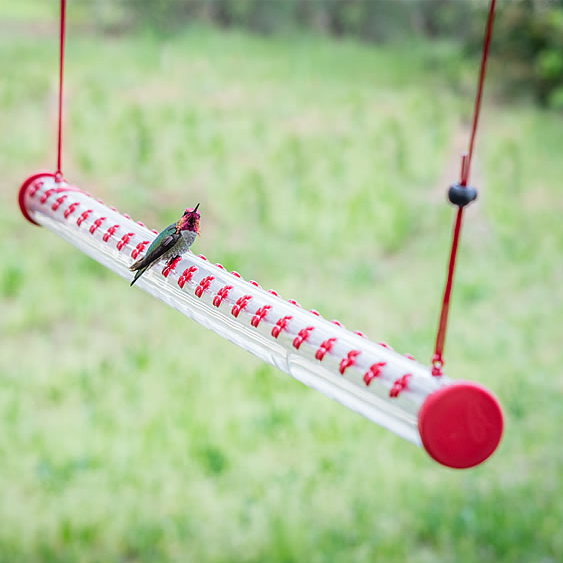 The revolutionary 4-Foot Hummerbar® Hummingbird Feeder offers a whopping 44 feeding ports in one easy to fill and easy to clean feeder. 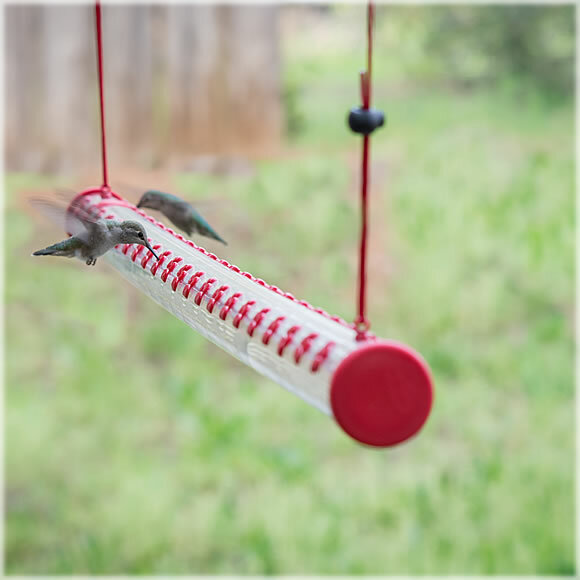 With a patented design, the Hummerbar® hangs horizontally from your porch or patio. Each port is perfectly spaced to allow hummingbirds to feed side-by-side, meaning you could literally be feeding 44 hummingbirds at one time. 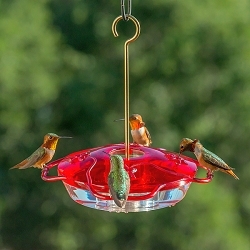 The feeder is built of a shatterproof clear plastic feeding tube, which allows you to easily monitor nectar levels. 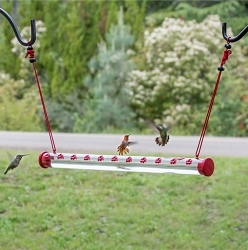 With the Hummerbar®, you get the ultimate hummingbird feeder! Note: Never fill the Hummerbar® more than half-full. Overfilling the Hummerbar® can cause the feeder to leak. 1. Remove an end cap. 2. 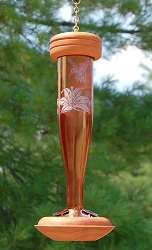 Remove nectar-pouring funnel from tube. 3. Replace the end cap. 4. Select an outdoor area to hang the Hummerbar®. 5. 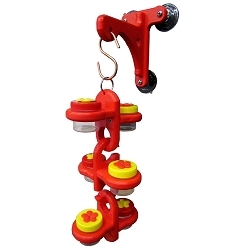 Hang using loops at end of hanging cords -- make sure the feeder is low enough to access for refilling and cleaning. 6. Level the Hummerbar® by adjusting its cords. Slide cord locks up and down as needed to level. 7. 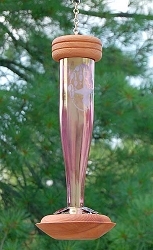 Remove rubber stopper from nectar basin and insert funnel. 8. 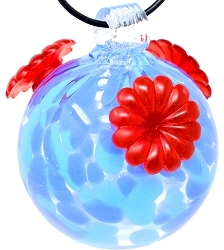 Fill about 1/4th full with hummingbird nectar. Compare each end by eye. If nectar is pooling to one side, then adjust cord locks again. 9. 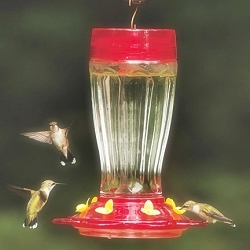 Once nectar is evenly distributed, continue to fill nectar basin until half full. Do not overfill. 10. Remove funnel, insert rubber stopper. If a 4-foot Hummerbar® is too big for your porch or patio, then try the 2-foot version. 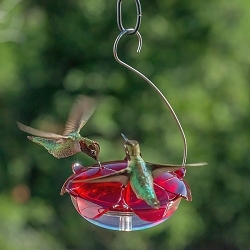 With 22 feeder ports, you can still draw in plenty of hummingbirds.